Family Volley: Is your Child Overly Sensitive...AKA lots of crying for no reason? Is your Child Overly Sensitive...AKA lots of crying for no reason? Do you have a child that is overly sensitive? Do they cry easily, experience quickly changing moods, and is prone to outbursts and tantrums? You are not alone. Research says that about 15 to 20 percent of kids are highly sensitive. As parents, the goal is not to change their sensitive personalities. Instead, you want to help your child cope with situations and learn to control their response. It is easy to label sensitive children as a problem child, crybabies, etc.. Don't do it. Don't let others do it either. Labeling your children will only perpetuate the problem. It is true, children live up to the labels we put on them. 2. Respect your child's nature. We need sensitive and caring kids and people in the world. We don't want to desensitize our caring children. We want them to know that we love them just the way they are. We also want them to know that we can help them better cope with the emotions that come with being sensitive. Remember the challenge from last week. Take the challenge and observe when your child is especially sensitive. Observe what works best to help your child. Do they need transition time between activities, are they getting enough sleep? Do you keep to a routine? Observe what helps your child handle life more successfully and try to implement your findings. 4. Don't say "TOUGHEN UP." Sensitive kids can't toughen up. They don't want to cry about everything, it is part of their personality. As parents we quickly find ourselves telling them to "stop acting like a baby," "big girls don't cry," "you are too big to cry like a baby.," "you cry more than your baby sister." Statements like this will not bring the changes you are looking for. 5. Teach your child to use "tough talk." 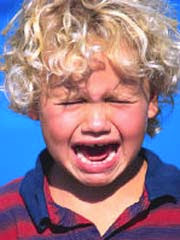 Sniveling, crying and whining will not get kids what they want. It will also embarrass them if they ever start crying and whining in front of their friends. Teach your child before they talk to clear their throat and use a firm and strong voice. You will need to teach them what that means. Role play and demonstrate the difference between whinny, and strong and confident. 6. Don't overprotect your sensitive child. It is natural to want to step in and rescue our children when they are upset. Our children have to learn how to deal with situations themselves. If we always come to their rescue, they will always depend on us, and will be less likely to handle situations on their own. Sensitive children have a hard time dealing with transitions and change. It is important to plan ahead, prepare your child so they know what to expect, and keep things regular and calm. We can't place unrealistic expectations on our children. 6 hours of errands running on fruit snacks, would make us have a breakdown too. Be sure your children get enough sleep, and enough to eat. This sounds obvious, but breakdowns often occur because kids are hungry and/or tired. Try not to over schedule your days. Be flexible so you can adjust if necessary. Staying home so your sensitive child can have some down time after school is more important than picking up milk. Have your husband pick it up on his way home instead. Teach your children what else they can do instead of crying. When the emotions are starting to take over, have your child....take a deep breath, hum a song, clear their throat, think of a happy memory, tell a joke in their head, bite their tongue. Anything to buy them a few seconds to gain composure. Then they can use their "tough voice" and express their feelings and concerns. As parents we assume children understand, when really they don't. What is obvious to us, is not to them. So... take a picture of your child when they are "normal." Sitting on the couch or hanging out. Then, take a picture of them when they are crying or acting out. Show them the two pictures so they get to see and understand what they look like. Then they can see the difference between in control and out of control. Point out their expressions and actions. Then they will better understand what behavior should change, and what is acceptable. 10. Listen to your child. In many cases, sensitive kids express unnecessary emotions because they don't feel like anyone is listening to them. Let them express their opinions. Be reasonable and allow them to tell you why they are upset. Acknowledge their feelings, don't just push them aside for the agenda at hand. Relate to them. You can do this by telling them stories from when you were young and felt the same way. Feeling understood is a huge step towards helping overly sensitive children control their emotions. 11. Put yourself in their position. Think about life from your child's perspective. Always being told what to do, how to do it and when to do it. They just get started in something they have been waiting to do and we tell them it is time to go, stop, or leave. They have little choice, voice, or power. Give them choice when you can, try to see their point of view, be sympathetic. Help them feel understood and they will be more willing to listen, curb the tears, and be obedient. Remember, temper tantrums are different than an overly sensitive child. DO YOU HAVE AN OVERLY SENSITIVE CHILD? WHAT BRINGS ON THE TEARS IN YOUR HOUSE? thank you, thank you, thank you!!!!! this (with the self-evaluation post) is EXACTLY what i needed! :)!!! Bess, so glad this is helpful. Thank you for this. My son is very sensitive and sometimes I just don't know how to handle it. The last thing I want is for him to start school and be labeled a cry baby...this post is exactly what I needed, thank you. I have an overly sensitive little girl. We have been working on it and it is getting better, but I think your picture idea is fantastic. I really think that might be the key for her as she doesn't seem to recognize when she slips into that overly sensitive and dramatic state. Great post, once again! This post sounds like it was written for the boy [age 9] I nanny. He's improved ever so slightly in the last year since I've been caring for him, but at times it is SO frustrating! He abhors piano lessons/practicing, so piano time brings on tears several times a week. If his homework is too frustrating he begins to cry. When he gets angry he cries. We use a point system for good behaviors/completing tasks - each day he has the potential to earn 1-2 points, if he didn't follow directions or breaks a rule and he doesn't earn his point for the day he cries. The list goes on. His parents and I have talked about it, and you're so right about respecting their sensitive personalities, but sometimes we lose so much time because he hasn't learned effecting coping strategies. He's also getting to the age that it seems like he's learning that he can manipulate people/situations by letting his emotions get out of control. It is so frustrating. I love the idea of taking a picture. I bet that would work wonders!